Question: Should I put plumbing antifreeze in the septic tank (black water/toilet) along with the septic treatment? I’m going snow skiing for 3 days. Answer: It really depends on the temperature where your RV will be parked. If it is going to stay above 32 degrees, and assuming you have the heat running inside the rig, then you should be okay without doing much of anything. If you are going to be in below-freezing temperatures for most of the time, then you can add good quality non-toxic RV antifreeze (one designed for RV use) to the septic system. You may not need to add a septic treatment to your black water tank if you are only going to be gone for three days and plan to flush the tanks soon after your get back from your skiing trip. However if I were you, I would determine if the RV has insulated/heated tanks. If the tanks are insulated/heated and you keep the inside temperature of the RV at 55 degrees or above you should not have a freezing problem and you will not have to do anything different for your trip. If the tanks are not insulated/heated and you are going to be in very cold temperatures, then you face a much bigger challenge. 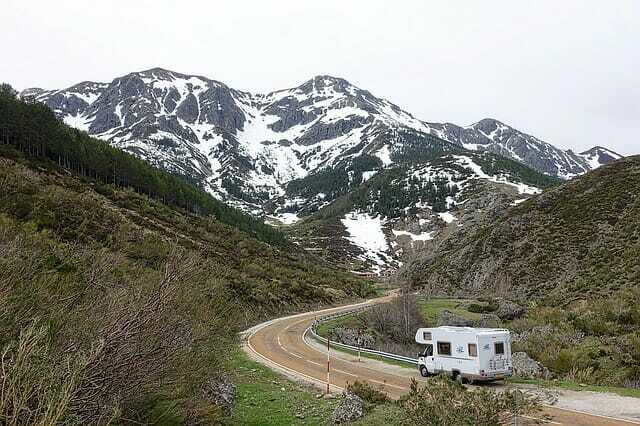 Your RV may not be designed to handle winter weather. If the RV is not insulated for winter use, you run the risk of burst pipes, cracked tanks and water damage. Again, what you do to prepare is weather dependent. Note that if it is below freezing, you might find that your fresh water source at a campground freezes. If you expect your three days to have extremely cold weather you should completely empty your all your tanks, especially the fresh water tank, to prevent things from freezing and cracking. Keep the interior of your RV at 55 degrees or higher to help heat your tanks. For drinking, cooking, washing, and flushing, use bottled water. Every time you pour water down a drain, you will also have to pour some RV antifreeze down the drain to keep the plumbing and tank from freezing. Use a mixture of bottled water and antifreeze for flushing the toilet. Just make sure not to dilute the antifreeze mixture too much or it will freeze. We have spent three winters in very cold weather in New York/New Jersey, but we have a well-insulated RV. We were also completely set up for a long-term winter stay with the use of heat tape, insulation, light bulbs in the plumbing bay and under our rig, and so forth. Obviously for a three day trip, you are not going to go to all this trouble. And if you expect to have moderate temps and sunshine where you are parked, then things should be pretty much business as usual.